Investing in a decent boiler could save you lots of money on your bills and will keep you warm and toasty in the winter months, without costing you a fortune. Though it may not be one of the most exciting purchases of your life, the one you have is very important. We have put the top boilers through their paces to see which ones are the right buy for you. We have compared them to their type, output, efficiency and fuel type to get the right suit for your home. If you need a new boiler more urgently, we highly recommend checking out Boxt – a new nationwide UK service which boasts next day delivery and fitting on all boilers ordered before 3pm. They are part owned by Bosch too – so although they’re a relatively new service, you know they’re backed by a big brand you can trust. Visit their website here. The highly celebrated boiler offers the best of all worlds with high efficiency, reliability and a display that is easy to use- on top of all that it is more than reasonably prices, sitting at under £600. Vaillant are renowned for being a prestigious boiler provider and that’s because they constantly provide user-friendly and highly efficient boilers, the Heatline is no different in that sense. It is a versatile boiler that manages to incorporate every aspect we need with it being easy to use, simple to install and a lot of power behind it. The condensing combi comes in two options- either 24kW or 28kW depending on what you need, this can be dependent on the size of your home. This boiler is perfect for a small to medium sized house but if you do not require something this powerful then you may wish to opt for the 24kW product. The A-rated boiler comes with a digital display that has full diagnostics and can be easily used, it even has a built-in frost protection feature. The boiler itself has great efficiency ensuring that you save money in the long term. It has side-panels and can be easily fit by a certified gas installer. 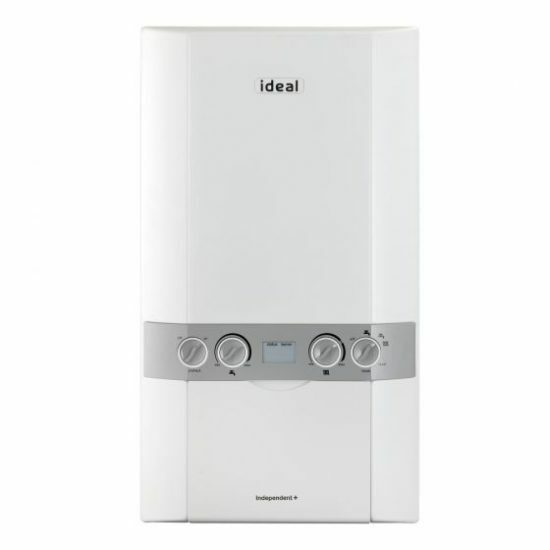 Outstanding combi boiler with 5 Star reviews. Affordable and high quality. One of the best budget boilers we could fins for under £1000, this Ideal model is easy to monitor and control to suit the needs of your home. You can choose to have it completely off, heat the water only or turn the heating and water on with the turn of a dial. Change the temperature of both with its own separate dial, and check the pressure alongside. It is easy to fit and set up, too, thanks to being lightweight and having a simple control system. This makes them a popular choice for installers as well. The built-in clock will allow you to set the heating to come on just before you rise out of bed in the morning or get home from work at night, without the need for any extras or expensive smart gadget controls. A great price and really easy to manage and monitor, it is perfect in any household, not just if you’re low on space. If space is a premium in your home, the last thing you want to be doing is filling it up with a boiler. This easy to use option from Vaillant is A-rated to help keep the costs of heating your home over winter down. And, it is perfectly described as ‘cupboard size’. Where it can be placed is pretty flexible. There is a top and rear flue option, and it’s Quiet-Mark approved so won’t disturb the household when on. You can use a flue up to the length of 10m, too. The small display screen is LED and clear to read in dimly-lit areas. No more struggling to see what it is saying when you need it the most. To save you a bit of money, it will detect when you don’t need as much heat as usual. In response, it will reduce its output to 20%, which also keeps things nice and efficient. And because it is smart, you can control it via the dedicated app. The Worcester Greenstar 30i Combi is one of the best combi-boilers available at the moment. Plus, it has been around for a little while which shows the popularity is still high. With easy to navigate controls, it is simple to get to grips with. Which is important, as the last thing you want to be doing is not knowing how it works when you are relying on it the most. The flue needs to be purchased separately, unfortunately. But once that is sorted, you have everything you need to get it installed quickly. It has been designed with small to medium properties in mind. The hot water control and performance is high, too. No wonder it has been rated highly by tons of other review sites as well. The Worchester Greenstar 30i has an A-rated energy efficiency level and is in compliance with current legislation covering new boilers and other heating appliances. Plus, you get a 5 year guarantee on parts and labour so all that money spent will be worth it. With an output of 30kW, the Worchester Greenstar 30i combi-boiler’s suitable for small to medium homes and can supply water and heating to four bedrooms and one bathroom comfortably. All under your control. The Vaillant Ecotec Pro 28 is a condensing combi at its best. With a powerful output of 28kW, it will be a perfect suit for smaller houses and flats. It delivers powerful performance while being A-rated energy efficient. It offers a high-efficiency pump and easy to use backlit interface display with intelligent self-setting gas combustion. The stainless steel build is perfect for busy homes as it will be scratch and dent resistant. It is also an unobtrusive design. Basic so as not to stand out, with all connections rear-facing. Thanks to the backlit display, even when it is dark or if it is in an airing cupboard, you’ll be able to see the vital data. Any issues can be resolved quickly and correctly. Having said this, we would like it to be a little larger. The Vaillant Ecotec Pro has removable side panels and easy-to-use settings to keep you in full control. Overall, a good buy for most homes. Its sleek and subtle design makes it the perfect choice to suit to any home. The Vokera 886 White Mynute is an A-rated, open vent model that is simple to use and powerful for your home. This one is only for central heating but can produce hot water when a water cylinder is installed alongside. It complies with new legislation for efficiency boasting 90.5% efficiency for your home. It has versatile fueling options and can be converted to LPG if needed. It provides flexible installation with a pipe from the top and one from the bottom. The Volkera comes with a rear flue option, making installation and checks even easier. With an output of 20kW, this is suitable for flats or small homes, suitable for homes with around 10 radiators and one bathroom. This compact system has earned it’s place on our list of the top compact models. Though it is small, this boiler is still able to put out a surprising 28kW and will have no problems keeping your home warm and cozy. This boiler is perfect for a family home where there isn’t enough space for a full sized boiler, but without compromising on quality, power or reliability. It will control both hot water and central heating which is ideal. Not only do you not waste any more energy than necessary, but you’ll also have much more comfortable temperatures in the shower and kitchen tap. The user interface is pretty clear and self explanatory, and the screen is backlit for easy viewing. All in all, it is a reliable boiler from a well-trusted name. This compact boiler will fit perfectly into even the smallest of spaces, and is great for a small family home that still needs the power of a large boiler. Boilers are integral to the functioning of any home. It’s likely to be one of the most expensive items you purchase so it’s important to do your research before you purchase. Buying a reliable boiler is essential because no one wants to face cold showers and no heating, especially when it comes to the winter months. The right boiler for your home depends on your central heating system. The majority of UK homes have a gas central heating system so many boilers are suited to accommodate this. Get prepared with our buying guide to help you through the whole process, from what type to pick all the way through to installation. These are the things you need to be aware of when buying a new boiler for your home. Most UK homes already use a gas central heating system, equipped with a gas boiler. Even though gas is a very common source of energy, there are other options, including oil boilers, liquid petroleum gas boilers, or a wood-burning stove with a back boiler. It’s probably easiest to get your hands on a gas boiler if that is what is already in your home. These are gas boilers that provide heat for your radiators and hot water when needed. These are usually suited for larger homes with multiple rooms and bathrooms. They use cylinder storage meaning they are usually stored in an airing cupboard. With combi boilers, you usually have to wait for the water to be heated before you can use it. These also use gas which is connected to a hot water storage system. They provide central heating and hot water through a boiler and water tanks stored in a loft. The storage cylinder is usually stored in an airing cupboard. Open vent boilers have high water flow rate which is great for quick showers. Once the hot water runs out you will need to wait for it to heat back up again. They are effective but take up a large amount of room in your home. If your household is running on gas then your boiler will amount to 60% of all your homes CO2 emissions. And this affects your wallet too. If you are looking to cut down costs on your energy bill and lower your carbon footprint then the boilers you get for your home is crucial. Many people tend to just use the same boiler from when they moved into their house, but old boilers are less economical and effective. Upgrade to a new model to cut back on your bills and reduce your emissions. With a new model you could potentially save up to £300 a year on your energy bill. Since 2010, boilers have become significantly more energy efficient. All boilers have to meet the A-rated guideline or be at least 88% efficient. Boilers don’t really have any snazzy features and high tech gadgets, what they do have are variable heating controls and settings. These put you in full control of your heating. You can decide on the heat setting and timer for automatic heating and hot water. Never try to install boilers yourself. It is dangerous and could cause a lot of damage to yourself, those around you and your home. When you decide on the right boiler get in touch with a heating engineer from the Gas Safe Register to install boilers for you safely. Some gas providers could suggest that they replace your boilers for you, without giving you a choice as to which boiler or model you want to get. This is because most heating engineers are adept at fitting specific boiler models and brands and this is the one they offer. If this is not the option you want to take then find a suitable heating engineer in your area. Make sure to check that they are able and competent to fit the boiler you want. Once you have bought a boiler, regular maintenance is needed to make sure it is working efficiently and safely. How Much Do Boilers Cost? The price of a boiler depends with the model, brand and type of boiler it is. The rough average price of a new boiler is around £1,500 to £4,000. Bear in mind you will have installation costs on top of this too. Companies such as Boxt now allow you to pay in installments rather than upfront depending on your credit record, which will likely be much more helpful. Most flats and average sized home with around 10 radiators, will need a boiler than a 24kW to 27kW would be fitted. For a medium sized home, around 15 radiators then the 28 to 34kW boiler will be fitted. The price of replacing a boiler depends on the boiler you want to get or your gas provider (if they can fit a new one for you). You need to buy the boiler and have installation costs, and may need to modify your home or other central heating appliances such as radiators. If you are only replacing internal parts of your boiler then it can cost around £250 to £300, depending on the part you need. What Boiler Is Better For A Large Home? For larger homes, a combi 28 to 34kW boiler is suitable. It’s important to get the right sized boiler appropriate for your size home so make sure you do your research to get the right fit. Are New Boilers Energy Efficient? Yes, all new boilers made after 2010 have an A-rated efficiency level and are at least 88% efficient. This is in line with law.